NES Zelda II: The Adventure of Link (USA) in 45:42.13 by inzult & Rising Tempest. Here is a non-glitched run of the black sheep in the Zelda series. Zelda has been put to sleep by an evil spell, and you must waken her by completing six palaces and then obtaining the Triforce again. 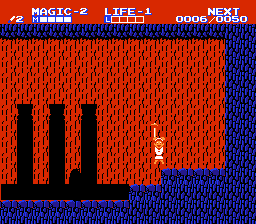 Unlike most Zelda games, the action parts are done in a side-scrolling view instead of an overhead view, and there are fewer items to use. One surprising feature of the TAS route is that magic levels are prioritized over attack levels at the beginning of the game; see the previous submission's comments for more explanation of that choice. This time, the run is improved by nearly two minutes due to different leveling, better optimization, and by skipping the Jump spell. For more details, see the submission comments. This movie avoids pressing Left and Right at the same time which causes an acceleration bug that can massively glitch the game. Watch this movie played on a real NES console.